I took a few weeks off from this little blogosphere, so it was a fairly quiet month here... but that's not to say there wasn't a hell of a lot of reading. 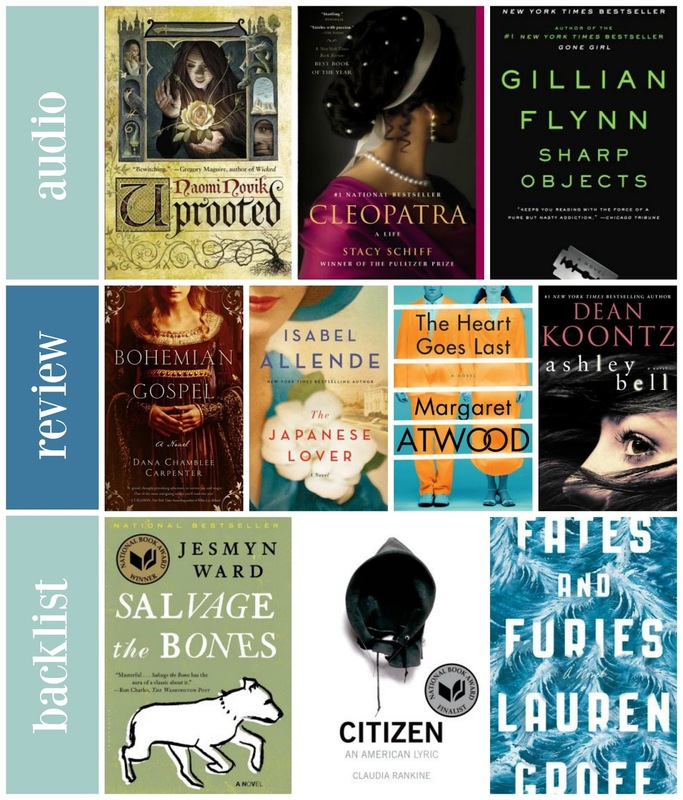 On audio, I wrapped up Uprooted, a quick, fun take on the classic damsel-in-distress fairy tale; devoured Sharp Objects, a dark and fairly fucked up murder mystery with the most dysfunctional of families; abandoned Cleopatra after remembering that narrative non-fiction really doesn't click for me on audio; and am now working on A Tale of Two Cities, which I'm enjoying with the help of Cliffsnotes (truly!) to make sure I'm keeping track of who's who and what's where. I powered through several review deadlines for a great stack of books: Bohemian Gospel (look for my review in Shelf Awareness in November); Ashley Bell (my review is here along with an interview with Dean Koontz himself! ); and The Japanese Lover, a complex and incredibly well done historical fiction novel from Isabel Allende (on sale in November); The Heart Goes Last (not my favorite of Atwood's works, but I liked it well enough). Because October is a crazy busy month for publishing awesome books, I also reviewed all of these for Shelf Awareness: Gold Fame Citrus; The Dead Ladies Project (seriously one of the best books I've read all year); Not on Fire, but Burning; The Best American Science Fiction and Fantasy 2015; My Year of Running Dangerously. And last, but certainly not least: the backlist. This time of year is one of my favorites as reviews tend to slow down for the holidays, so I can focus on those books I've been accumulating. I got a jumpstart on that with the Readathon, during which I gobbled up the very, very, excellent Fates and Furies (seriously, this book is SO excellent); followed by the emotional, complicated, intelligent writing of Claudia Rankine's Citizen. Continuing the trend of heartbreaking, incredible, impressive and depressing novels, I finally got around to Salvage the Bones by Jesmyn Ward. I got a chance to talk with the author of the stellar and amazing new cookbok, The Food Lab. This interview with J. Kenji Lopez-Alt was fun *and* informative. Andi at Estella's Revenge talks about a few new digital communications tools and the changing landscape of the blogosphere. As one who took several weeks off this month, this got me thinking. Leah at Books Speak Volumes draws parallels between Harry Potter and Jane Eyre. Mind. Blown. I know, I know: I won't shut up about running lately. But I really enjoyed (kind of?) 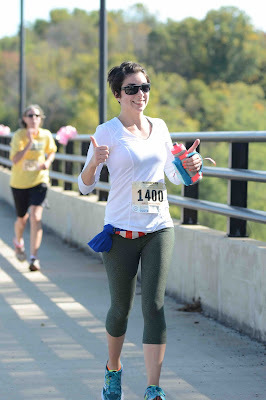 my October half marathon; here's my recap of the run and my thoughts along the way. And because it's Halloween, check out this Mighty Girl round-up of awesome Halloween-themed cocktails! What are the best things you read this month?